Our next stop on our whirlwind round the world tour was one of my favourite places in the world, Edinburgh, to celebrate the new year at one of the biggest celebrations in the world, Hogmanay. Of course, things weren’t going to go smoothly. We had only been away from Australia for less than a week and had managed to fall victim to a Bangkok scam and have a very disappointing visit to the Egyptian Pyramids. We were very happy to leave Egypt behind us and arrive in Scotland. I love Scotland. 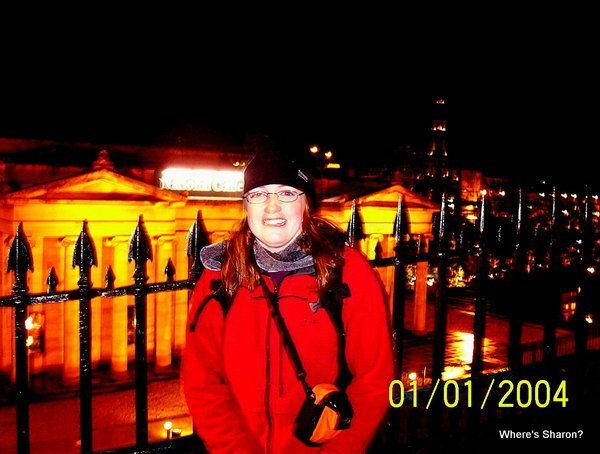 The previous year I had worked in a pub in Scotland, and I was very happy to return, especially for Hogmanay. Hogmanay is Scottish for the last day of the year and has become synonymous with the New Years Eve celebrations in this country. There are many Hogmanay events throughout Scotland, but the biggest one is in Edinburgh, so that is where we wanted to go. The whole trip had actually been planned around visiting this event. Tickets are a bit of a hassle for non residents. Technically, according to the organisers, you couldn’t buy tickets. You could apply and get them as resident. As non-residents, we had to become a member of an organisation set up to distribute tickets. Anyway, it took a bit of mucking around but we had managed to secure two. It was cold, dark and miserable when we arrived in Edinburgh at 4pm. We didn’t expect anything else considering it was the middle of winter. We went to our hostel and had a couple of drinks before heading into town. We got to the street party about 9pm. It was windy and raining a bit, and there were not many people there yet. We walked around for about an hour and then headed into the first warm pub we could get into (they were very crowded) for a drink. By this time, the street was crowded with people, and we were in shock. Cancelled? Really??? Just before midnight and with this many people at a street party, they were going to cancel it? The weather was far from pleasant, but it didn’t seem that bad either. It was Scotland in winter, surely this was how it was supposed to be? We stayed around awhile thinking that surely there would still be some type of party, but we just got pushed around the throngs of people leaving, it was freezing and nothing seemed to be happening at all. There were rumors of a pending terrorist attack that many people were believing as it made more sense than bad weather shutting down a massive event in Scotland. The pubs were full, so we ended up going back to our hostel and spending midnight in our room! It really wasn’t the new years eve I envisioned when I planned this trip so many months earlier. I was incredibly disappointed, especially after the disappointing time in Egypt, and the fact that our next stop was New York City. I was wishing I had planned to spend New Years Eve there. 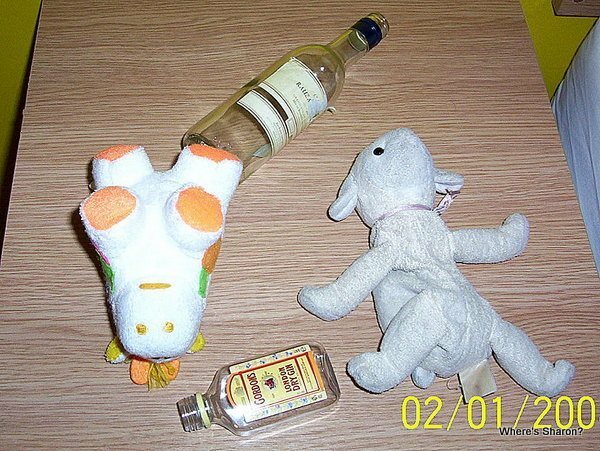 At least someone had some fun! The next day, the headlines in the local newspapers were all asking why there wasn’t a back up plan. The event had been cancelled due to the winds which meant some of the stages could not be used and the fireworks were off. I still don’t understand why this necessitated cancelling the whole event. I don’t think the newspapers did either. 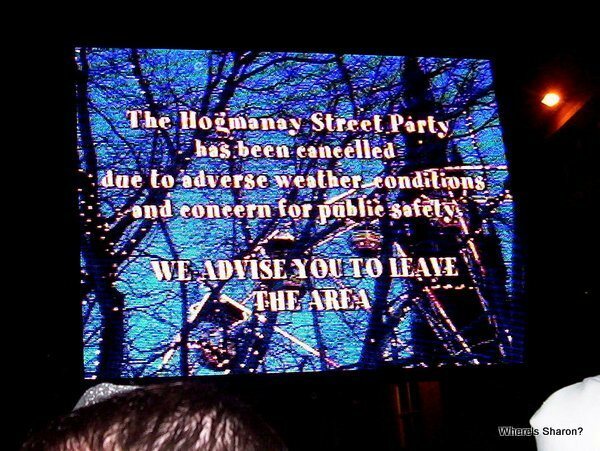 Other Hogmanay celebrations continued, including Glasgow’s, just an hour away. I had to agree with the headlines. Where was the backup plan? There was no refund on the tickets, as technically, we hadn’t had to buy them. Although the cost of the tickets paled in significance to what it had actually cost to be there! As for Edinburgh, it is probably lucky that I had been there before and really enjoyed it or I would never have wanted to go back. Apart from Hogmanay being cancelled, the hostel was loud and a hassle, and our return taxi driver caused us some dramas. In case you can’t tell, I am still annoyed, angry and bitter over the whole thing! I really think the whole situation could have been handled better. Next week’s Flashback Friday post will cover my experiences hiking the Inca Trail. Have you ever travelled to an event just to have it cancelled? What was your best New Year’s Eve experience? Oh no! I can understand how you feel, especially because New Year’s Eve celebration in NYC is supposed to be this big bash. I spent 2 years in Vancouver, where they BANNED New Year’s Eve fireworks. I couldn’t believe it, so I went downtown anyway in my first year. There were throngs of people on the streets, all looking up at this clock tower…which didn’t have any minute hand. There was no countdown, no clock striking 12, no fireworks…people just tentatively started cheering at around 11:58 or so for about five minutes, just to be sure that they were cheering at midnight, I guess. It sucked and I chose to just stay home the following year. That is crappy! How much can it cost to just put a countdown clock up or something?! I lived in Edinburgh for 10 years and only once the party was cancelled…the year I spent it fighting with extreme storm in Porto. What a shame you had a bad luck, but to be honest the street party in Edinburgh is overrated and the fireworks are not that good. It is so crowded that you cannot cross the street. All other events there are amazing, so if you ever have a chance to visit Ediinburgh again-do it! Especially beyween June and August. I just love that city then. And the Fringe Festival in August is mind blowing, although you can barely walk there…but the atmorphere and people make it so special. Happy travels to you Sharon and your family.